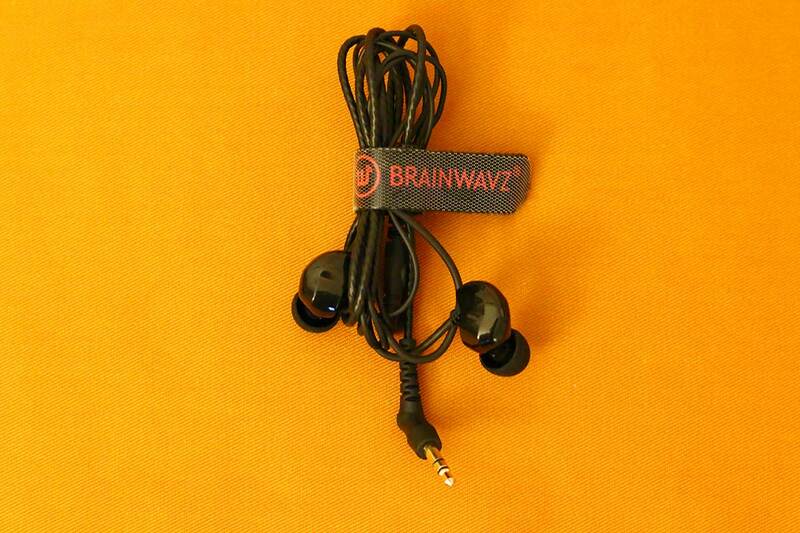 Meet Brainwavz: a company with a slightly strange name, based out of Hong Kong, who make some fun stuff. Most of it is of the portable audio variety - not just earbuds and headphones, but also stands, cables and pads. Interesting indie audio companies always make us prick our ears up, so to speak, so we were chuffed when Brainwavz offered to let us review two of their earbuds: the quad-driver B400s, and the smaller B200s. We’re still evaluating the former, but in this review, we break down the design, comfort and fit, sound, packaging and accessories, specs and more of the B200s, as well as how they compare to other models. You can also check out our video review. They have a very simple design, edging into the ho-hum, with a basic shaped housing connected to a flexible ear hook and thin cable. A set of interchangeable tips are at the edges of the housing. At first glance, we were interested, but not massively impressed. They don’t have the eye-catching design of something like the Campfire Audio Lyra – somewhat unfair comparison, perhaps, given the price difference between the two, but it’s still evident that these aren’t really lookers. You’re definitely not going to get people stopping to ask where you got those amazing earbuds. The overall aesthetic is subtle, clean, and clear. Looking deeper, however, there are a few interesting things going on here. Chief among these is the fact that the housing is 3D printed – something that is becoming a lot more common these days, especially in earbuds and headphones. The AudioQuest NightHawk Carbon headphones (full review here) used the technique, too. What it means is that while the housing is lightweight, it’s highly robust and flexible. While we didn’t throw these things against the wall (because we’re not stupid) we don’t imagine there’d be any issue with having them knocking around in a gym bag for a while. You won’t need to do that – the company has some great accessories on offer, including a rigid case, which we’ll talk about in a little bit more detail below – but at a time when so many earbuds can often be flimsy, it’s great to see that a pair costing $120 delivers on build quality. It may not use advanced materials, but it certainly gets the job done. And they are lightweight: barely 3oz. Our cables weren’t removable, although ordering direct through the Brainwavz website allows you to equip your B200s with a variety of different cables, as well as a sweet-looking clear housing (ours was plain black) the cable itself, while not being completely free of tangle issues that plague so many high-end earbuds, generally managed to behave itself, not giving too tangled up even when we carelessly left the buds lying around. Again the accessories, which we will get to in due course, help with this. One of the things that we did find annoying about the cable was that there was no in-line microphone or controls – a puzzling oversight, especially for the amount of money you pay. While you could argue that these sound best when driven through a good desktop setup, they also have a low enough impedance that they are perfectly suited to being driven by a mobile phone. Indeed, we’d argue that you’d be crazy not to, given how lightweight they are. So the lack of controls or microphone is bizarre, to say the least. Instead, what you get is a flexible wire connector with a cinch bracket. Fine, well and good, but not exactly exciting. The end of the cable on our review model terminated in an angled 3.5 mm connection. Beyond that, there’s very little else to report about the design. It’s basic, functional, well-made, and it works. Brainwavz offer a very generous 24-month warranty, which should more than cover any issues with the earbuds - not that we anticipate many, given how well-made these are. Give it to Brainwavz: unlike so many other companies, they go out of their way to make sure that the fit and comfort really works. It’s a crucial part of owning earbuds, and it’s great to see so much attention paid to it. It’s the ear hooks that are the key. Many hooks these days are quite rigid, and often a little bit uncomfortable to wear; these slot happily over the top of the ear, and in general, they stay where you put them. Following on from that, the company not only provides six different sets of silicon ear tips, allowing you to customize the size to your hearts content to get good isolation, but also a set of our perennial favorites, Comply eartips. For our money, these are still the best way of ensuring a good fit, and it’s a bit of a fist-pump bonus to find them included as standard, which is by no means a given with many other products. What really impressed us was how little tinkering it took to get a good fit with these earbuds, choosing tip sizes aside. They genuinely feel like they’ve been tested well in this particular area, and if you’re concerned about comfort, we’d strongly recommend these. The thing that surprised us most about the B200s was just how open they sounded. To be clear, we aren’t talking about the open, breathy airiness of open back headphones; these aren’t quite that good. But when so many earbuds tend to be quite boxed in and compact, which is thanks to their isolation, the first thing that really made us take note of these buds was just how good the stereo spread was. It genuinely felt like the soundstage was a lot wider than it had any right to be, and we found it was something that we kept noticing throughout our listening tests. The audio quality felt deep and well-spaced, which allowed each individual instrument to shine. It was a genuinely pleasant surprise, and something we definitely weren’t expecting. These are balanced armature earbuds – by which we mean a metal coil framework held between two magnets, distinct from the standard dynamic drivers which populate so many cheaper buds, and which are known for having much more character and warmth. That’s definitely the case here. While these don’t quite reach the heights of more expensive headphones, they are absolutely stunning for their price class. For $120, we did not expect to find audio this good. The audio quality definitely wasn’t neutral, or reference grade. Instead, they warmed up the music dramatically, injecting the sound with a level of excitement that we found addictive. There is a genuine sense of richness here, a dense, meaty detail to each of the individual elements. While there was a slight touch of muddiness and confusion on particularly busy tracks, it was very rare; for the most part, these earbuds really impressed us. We would easily put them up against the MEE Audio Pinnacle P1s (full review here), in terms of sound quality. The P1s would probably edge it, but it would be a very close run thing. And given that the B200s are a full $60 cheaper, at the time of writing, that’s quite something. The B200s have an impedance of 30 ohms, and a sensitivity of 110dB. We had no problems driving them with a smartphone, and they absolutely sung when put through a desktop amp. Despite the lack of in-line controls, these are eminently capable of swapping between different scenarios. And in sound terms, these get a big thumbs up from us. They do almost everything right, with audio that is always good, and frequently great. One of the best parts of this job is being surprised by a piece of audio equipment that doesn’t look like it’s going to be able to deliver anything exciting, and which subsequently knocks our socks off. Bravo, Brainwavz. You get rather a lot for your money here. Although our review set didn’t have a detachable cable, these come as standard on retail models, with not one but two different cables in the package. One is a 3.5mm stereo cable, and the other a 2.5mm balanced cable, which gives you a little bit of flexibility. Not having these, we couldn’t test them, but it’s always good to have cable options. What we can comment on the other accessories, which are comprehensive. You get an absolutely fantastic Velcro cable tie, which not only attaches to itself quite happily (making it easy to wrangle the thin cable) but also attaches to any soft surface, meaning that the headphones won’t bounce around the carry case. Outside of that, and the aforementioned silicone and Comply ear tips, you also get a branded shirt clip, which is very handy for keeping the earbuds in place. The case, too, is excellent: a compact, rigid, zippered container that can be easily stuck into a pocket, or shoved into a bag. There are two mesh pockets inside it that help keep things in place, like the additional cables. It’s great to see so much attention being paid to the overall experience, and the accessories here, like the sound and the build quality, get a big thumbs up from us. The earbuds actually ship inside the carry case. The external package is a simple cardboard box with an interior moulded container, which is nothing special. Brainwavz aren’t the most well-known company in the audio world, but perhaps they should be in that conversation. We live at a time when most people will be perfectly happy with a clunky pair of Beats By Dre, or Bose, or Skullcandy. These often cost around the same price as something like the B200s, and aren’t nearly as good. It’s become more important than ever for audio companies to start cutting costs, as they tried to capture demographic that isn’t particularly interested in paying for good audio. This pair of earbuds is definitely a step in the right direction: a well-made, rewarding piece of kit that offers huge amounts for the money, and sounds genuinely good. We’ll be reviewing the bigger, more high-end B400s in due course. But if you’re looking for a pair of earbuds that are going to deliver huge value, and reward you for years to come, then this is where you should be starting. While the lack of an in-line microphone will be an issue for some people, as it was for us, it’s far from a dealbreaker. If you can deal with it, you should absolutely look at these. No in-line controls or microphone. If you have a little bit more money to spend, we strongly recommend taking a look at these. While they are more expensive than the B200s, their sound quality is just out of this world. They offer gorgeous, pinpoint audio detail, all wrapped up in a package that gives you a huge amount play with – including the missing microphone and controls from the B200. They also have an appealingly sporty look. A viable alternative. 1More are making a lot of waves right now, and with good reason. They are delivering some excellent earbud construction, and some truly groundbreaking models. The Triple Driver, we think, is the best of the lot. It’s a little cheaper than the B200s, and while the sound quality isn’t necessarily better, it definitely has its plus points. The buds have twin balanced armatures, as well as a single dynamic driver, doing them the best of both worlds. Definitely worth looking into. These are a little old now, and recently underwent a price drop. They are a very viable competitor to the B200s, and definitely have some plus points to consider. The sound quality of the B200s is more than capable of competing with the P1s, but what they don’t have are the best carry case in the world, and a robust metal housing that still makes us happy, even today. These really are a killer pair of buds. Read our in-depth review.